The Liftkar PT S stairclimber is similar to Liftkar PT Outdoor, except it has smaller non-marking wheels so it is designed rather for indoor use and for stairclimbing. It is also equipped with a comfy seat, armrests that cal be folded upwards, a headrest and a seat belt. 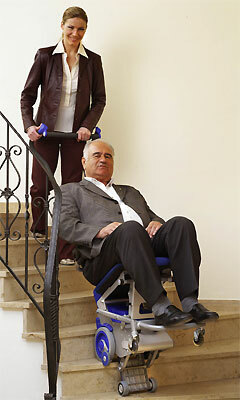 The Liftkar PT S is available in two models: S 130 and S 160. These numbers indicate the maximum load capacity, so in other words the maximum weight of the transported person.